You're on the run from hordes of the undead in #killallzombies, with nothing but your wits, an itchy trigger finger and a decent amount of luck to keep you alive in this latest twin-stick shooter for the PlayStation 4. Starting out, it should be noted that #killallzombies doesn't quite feel like a complete game. That's not to say that what's on offer isn't solid enough, just that when a game only packs in a single mode and promises another two are on the way, it feels a bit rushed to market. There are co-op and protect the flag modes inbound, apparently, but if you plan on diving into #killallzombies right now, you're strictly limited to surviving as long as you can, all by your lonesome. Thankfully, that solo survival mode is well made and offers up some unique new twists on a genre that's been hugely popularized over the past generation of consoles. In #killallzombies, your objective is right there in the title. You'll run around a hex-based arena shooting zombies and doing your best to keep on moving. You also have a melee button that's almost completely useless and a reload button that I may have tapped once for the sake of seeing that, yes, it reloads a gun that reloads itself quite fine when you naturally run out of bullets. From the onset, you'll have access to a single pistol. As you progress through waves of zombies, you'll unlock even better starting gear. The goal is to push forward a little bit further each time you play the game so that, eventually, you'll have a killer collection of firearms to choose from when starting out a run. While you'll be blasting away on an empty field initially, the arena becomes more and more dynamic as you move along. Some of the hexes will shift in order to create alternate paths, protect you from the zombies or sometimes box you in with a group of them. Spinning blades of death or laser turrets might pop out of the ground, giant weights might fall to the ground or even vehicles could appear. The trick is in figuring out how to best utilize these various environmental hazards. 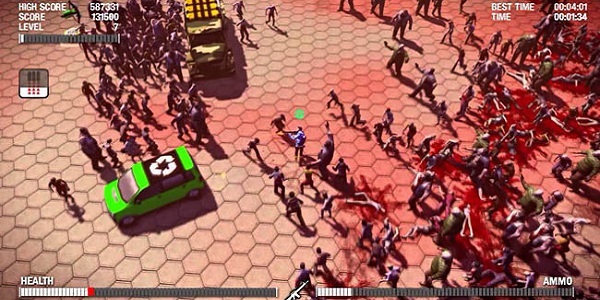 Lure a bunch of walkers toward a med truck, for instance, and you can blow the vehicle up and wipe out all of the zombies who were standing near it. As a bonus, med trucks also drop health boosts. Get the zombies to follow you toward some of those spinning blades of death and watch as many of them stumble into the choppers. You see that exploding barrel? Yep, you guessed it. Lure some zombies near and send them sky-high with a couple of well-placed shots. Your undead enemies run the usual spectrum from slow shamblers to fast fiends. There are larger zombies that take more damage to put down, and some that will attack you in unexpected ways. There are also occasional bosses, which will give even the most skilled twin-stick shooting fans a run for their money. Along the way, you'll earn access to perks that can be triggered on the fly. Just like with the randomly appearing environmental elements, I feel like I'm still being surprised by a perk I've never seen from time to time. These are where the game's real variety comes in. Hit a button and a selection of four random perks will be available. Mash the button you want and, boom, you have faster movement, more deadly bullets, virus-infused rounds, tougher skin, etc. Some of the perks offer more devastating effects, like a timed cloud of destruction that kills anything you touch, or a nuke that kills pretty much everything on the screen. Others offer a unique dilemma, like forfeiting some of your health in order to get a better weapon, or a 50/50 chance that you'll either die instantly or earn a whole bunch of bonus points. It's a rather brilliant system and, if you're playing on a live stream, the folks watching the game will have a say in which perk you unleash. Depending on who is viewing your reign of carnage, that can either be a good thing or a bad thing, obviously. #killallzombies has some interesting hooks that make it a pretty decent “just one more run” kind of game. Unlocking better starting gear to make the earlier waves feel less like a retread and those random environmental and perk elements keep things fresh for a while. I'd be really interested in trying out those other modes, especially co-op, but apparently we're going to have to wait on those. As is, #killallzombies is a good twin-stick shooter for players who need that particular itch scratched on the PS4. It may not have the legs of genre greats, and some other promising options are coming down the pipeline but, for now, it's a nice middle-of-the-road kind of game.